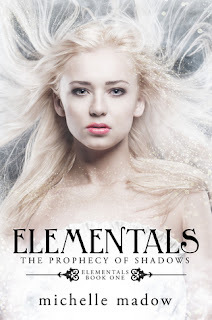 Blurb Description: Filled with magic, thrilling adventure, and sweet romance, Elementals is the first in a new series that fans of Percy Jackson and The Secret Circle will love! Here’s the thing with name dropping* - don’t do it. I understand publicity techniques, but if the synopsis is catching enough I don’t need hints of it being like all these other books to convince me to read it. If I really really liked a series, and you name drop it on another book, I’m quite literally sitting there, expecting the same level from the new book! *Name Dropping is what is done on the blurbs of books, to get readers to relate it to other books in their heads. For example, "Perfect for fans of Sarah J Maas and Leigh Bardugo,"
And then The Prophecy of Shadows came out. Practically in love with Michelle’s Secret Diamond Sisters’ Series, I decided that her new book would definitely be worth a try! And I can quite honestly say that if it hadn’t been compared to Percy Jackson, I would have liked this book a whole lot more than I did. Starting off with a not so nice Harry Potter reference didn’t help too much, but at the beginning of the book, I could definitely see that I would get into this. All the energy channelling and colours and secrecy was something like my favourite Wicca novel, and everything was right in the world. The characters were introduced well, their motivations hazy, just like I like them and the protagonist denying that she could be so special, and going ahead and saving the day – all elements that I love. And then came the forbidden bad boy, and the chemistry that not only could I not feel, but I later realized couldn’t feel because it simply WASN’T there altogether. Then the characters weren’t complicated at all, but just plain vanilla and boring. Their GRAND prophecy was printed out on a piece of paper, and then entire book seemed like one big treasure hunt rather than an actual quest. Everything was in one city, down one road, and the Five in the Prophecy got their part of it all too easily! I don’t know what to say really, except that I was expecting something like Percy Jackson, and it didn’t really deliver! I'm not really jumping to read this one, with all the 3 star reviews pouring in. Not that 3 stars is bad, but I'm looking to be blown away. Great review!